Gale Virtual Reference (a database of encyclopedias and dictionaries) view the entry for "Anthropology and Food"
JSTOR (good coverage for Anthropology),(a database of encyclopedias) view the paper on "Romanian Werewolves: Seasons, Ritual, Cycles​"
Academic Search Premier (a database every student should know),view the search results for "ancestor worship"
ARTSTOR (this database has set aside a unique collection of more than 100 images of objects to introduce the subject of Anthropology). Every research project should begin with defining and understanding any terms, concepts or topic sub-components that are not clear. Here is where the Gale Virtual Reference Library (GVRL) (a database of encylopedias and dictionaries) can be a big help. The encyclopedic entries in GVRL present topics and their associated sub-topics in a systematic way. Here's an example of what GVRL has on a search for "ancestor worship." The handout below reviews Boolean searching techniques. Academic Search Premier is a database that every student should know. It supports most classes taught at Cañada. Boolean searching is a highly effective way of searching. Try to conceive of your topic in 2-3 intersecting concepts. Place each concept in one search window. Enter synonyms for each concept. Use the * asterisk symbol ("wildcard") to find relevant word forms. Here's a search seeking information on the "universality of ancestor worship." In this search notice the use of the asterisk. The asterisk is a wildcard character. This means any character can substitute for the asterisk. Therefore, this search will find the keywords of Africa, Asia and mesoamerica as well as related word forms: African, Africans, Asian, Asians, and mesoamerican. The asterisk is a good search technique for increasing relevant search results. ARTSTOR offers its users more than 2 million high-quality images for suitable for educational and research use via its Digital Library. ARTSTOR has curated unique groups of images to introduce various topics and disciplines. ARTSTOR images can be downloaded and citations generated by the DB. "The rites of passage, ceremonies and rituals of global societies are presented in photographs, artifacts, and instruments from prehistory to present times. This selections also includes portraits of anthropologists, and views of excavated sites." It is important for students to develop good research skills. The handout below presents a 7 step research procedure that focuses on the use of Library databases. These databases can be searched effectively using simple Boolean search techniques. JSTOR's coverage of the humanities includes 88 academic journals specifically on Anthropology. 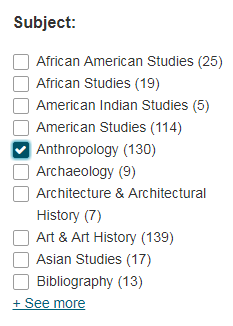 You can enter an "advanced search: in JSTOR and limit your search results to just papers appearing in these 88 anthropology journals. Or, you can let your search look across a wider range of sources. 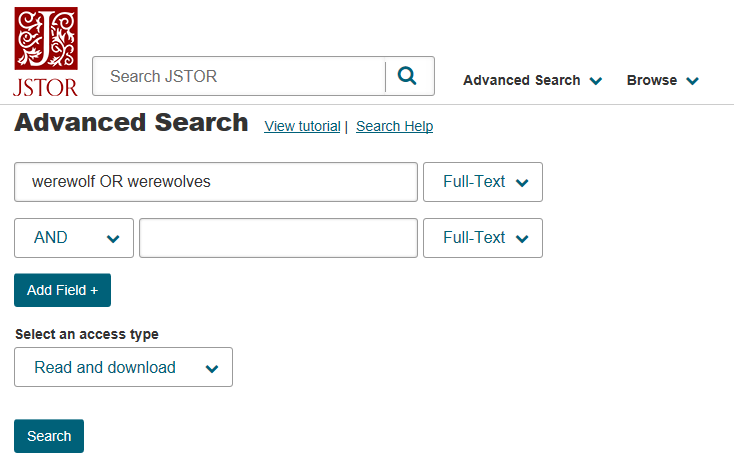 The search box below, which appears in the JSTOR "advanced search" window is an example of how you will limit your searches to just "anthropology" sources by clicking on one of the subject areas. Ethnographic Video Online is a rich database of streaming video content that focuses on "...the study of human culture, behavior and society around the world. The collections contain over 1,300 hours of streaming video, including ethnographic films, documentaries, select feature films, and previously unpublished fieldwork." 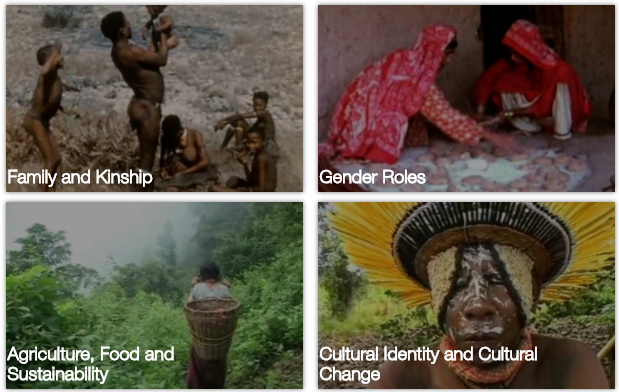 Enter a simple keyword search to find videos that will help you explore possible topics for your Anthropology research project. Or, find videos that take you to a deeper level as they reinforce concepts introduced in your introductory Anthropology course. The Films on Demand database contains over 253 full length feature films related to Anthropology and topics of Anthropological interest. This database can be searched by simple keyword searches or by clicking on a "subject" tab on the right hand. Click here for videos on "zombies" limited to the discipline of "anthropology." Need to visit a museum as one of your class requirements? Admission could be free. Discover & Go provides San Mateo Public Library card holders with FREE passes to local museums and other cultural institutions. Make your reservation online choosing by institution and date. Print your pass at home or at the library. Click on this logo to see what passes are currently available. The passes offered changes throughout the year as different museums offer, withdraw, or re-offer passes through Discover & GO. Plan ahead as passes to popular sites are quickly snatched-up. If you do not live in San Mateo county, check with the website of your hometown's public library. Many public libraries in the bay area offer the Discover & Go passes.